Kevin, the three-year-old grandson, just left to fly back home to Palo Alto with his parents and baby brother. The brother's name is Ryan, but Kevin calls him Baby. So, we all call him Baby and I wonder if the nickname will stick. 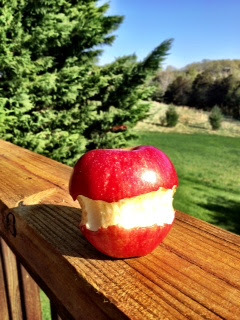 Kevin left behind this apple, which he'd eaten in an exact circle around the middle. That's all he wanted to eat. Not the top, not the bottom. Just the middle. He put it on the rail of my deck while he was busy lining up his toy trucks. And kicking the green ball off the deck to the field down below. And talking to Baby. And playing with Bubba, my dog. I wonder if I can get the apple bronzed, like people used to do with a baby's first shoes. The New Best Friend who becomes a Best Friend Forever. You share every single silly thing. The pair of shoes to die for. The perfect red nail polish. The diet that works. The career breakthrough that thrills. The setback that forces us to re-tool and persevere. The put-down that hurts. The hug that heals . . .
“Piglet sidled up to Pooh from behind. See more quotes on the "HOW TRUE!" page. Text and photos © Katey Lee. Designed by illuminatheme.com. Powered with Blogger. Converted by LiteThemes.com.